Human threats – Brent Hughes, Ph.D.
Wasson, K., R. Jeppesen, C. Endris, D. Perry, A. Woolfolk, K. Beheshti, M. Rodriguez, R. Eby, E. Watson, F. Rahman, J. Haskins, B.B. Hughes. 2017. 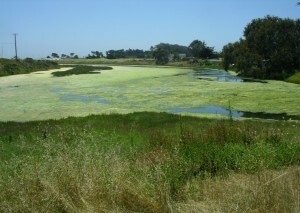 Eutrophication decreases salt marsh resilience through proliferation of algal mats. 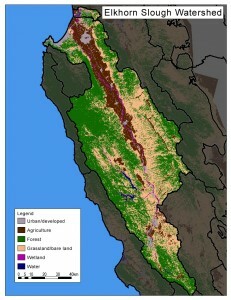 Biological Conservation. 212:1-11. Often times human threats don’t come alone, they often come in pairs or more, making it challenging to assess their relative or synergistic effects. Part of my research investigates how multiple stressors affect the functioning and diversity of ecosystems. 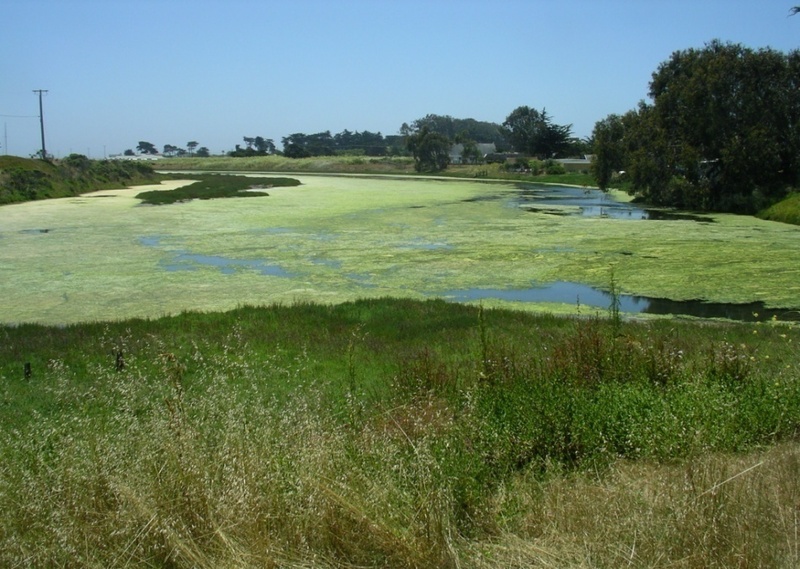 My research has focused primarily on how eutrophication interacts with other stressors, such as habitat alteration and ocean acidification. 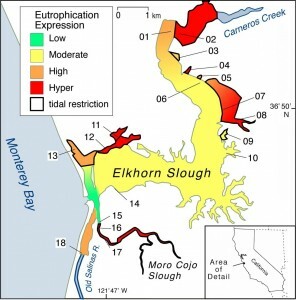 More recently, I have been advancing this research to look at how eutrophication and the interaction with tidal restriction influences hypoxia over decadal scales in Elkhorn Slough. Using the fish assemblage as a model group I am determining how variation in hypoxia influences the diversity and abundance of fish, the climatic forces that affect hypoxia and subsequently fish, and the influence of nursery conditions in Elkhorn Slough on nearshore adult populations in Monterey Bay. For the latter I am using flatfish, primarily English sole (Parophrys vetulus), to test for the effects of hypoxia in its primary nursery grounds (Elkhorn Slough) on the offshore adult population and fishery. 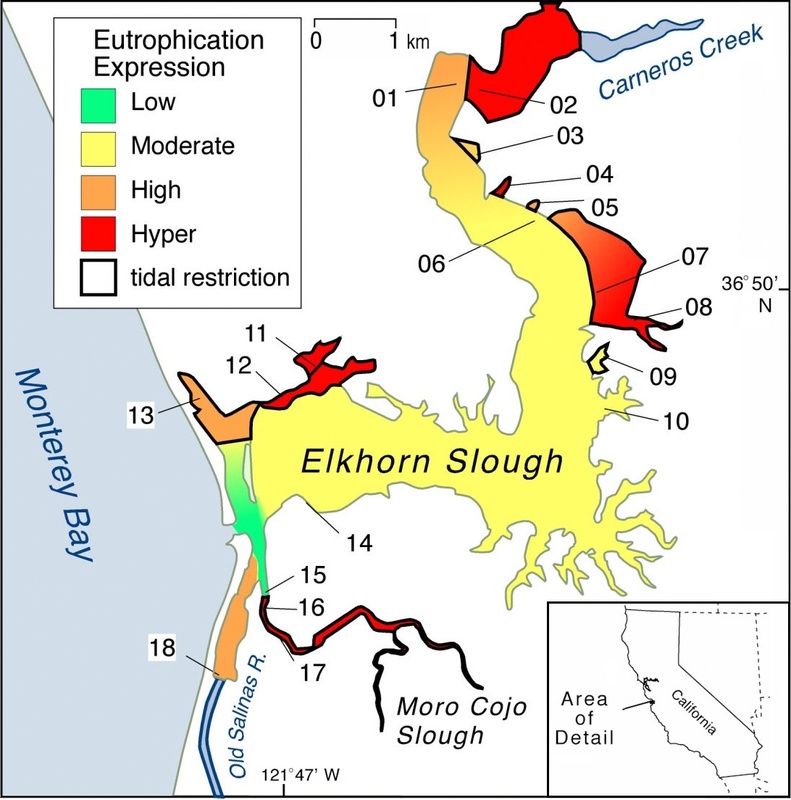 Probability of finding three of the most common flatfish species in Elkhorn Slough during varying ENSO conditions. Flatfish habitat generally improves during El Niño conditions. However, areas behind tidal control structures are often devoid of flatfish due to consistently poor oxygen conditions and disruption of fish passage. Hughes, B.B., M.D. Levey, M.C. Fountain, A.B. Carlisle, F.P. Chavez, M.G, Gleason. 2015. 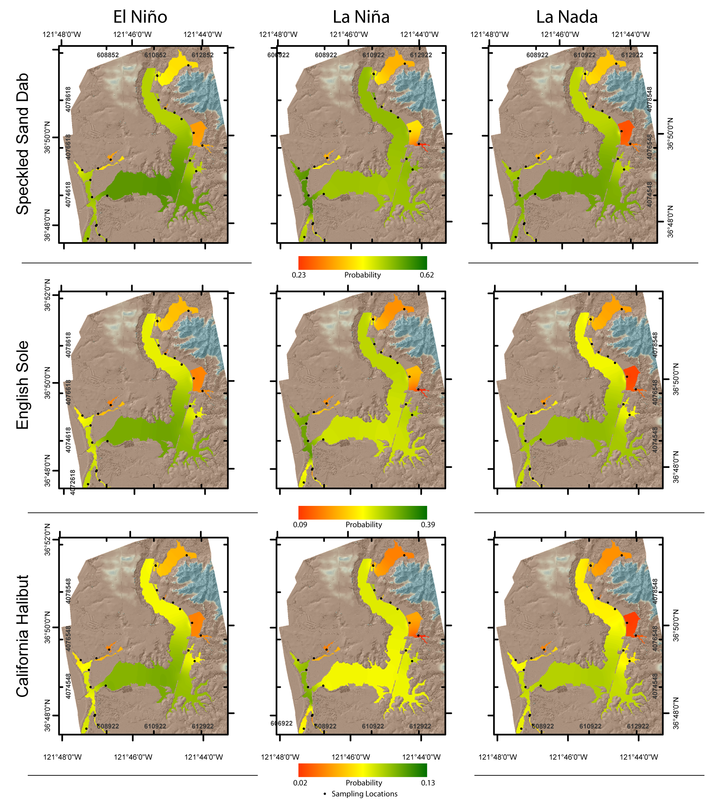 Climate mediates threats to fish diversity and nursery function at the land-sea interface. Proceedings of the National Academy of Sciences USA 112:8025-8030. 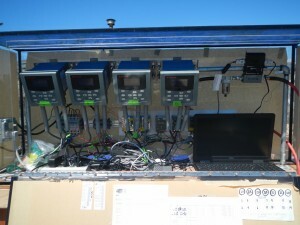 Jeppesen, R., *M. Rodriguez, *J. Rinde, J. Haskins, B.B. Hughes, L. Mehner, K. Wasson. 2016. Hypoxia increases fish mortality and reduces oyster growth in a highly eutrophic estuary. In press. 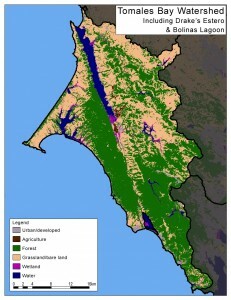 Estuaries and Coasts. Climate change has brought about profound changes in ocean chemistry through the process of ocean acidification. 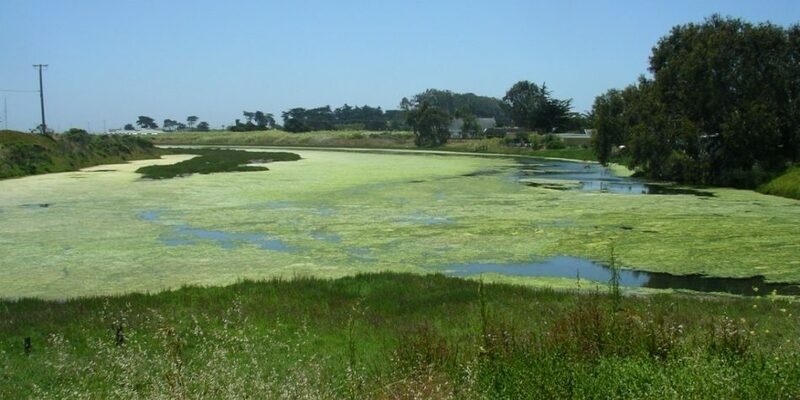 This along with increased upwelling along the California current and increased eutrophication can ultimately draw down pH in coastal systems that can fundamentally change their functioning. 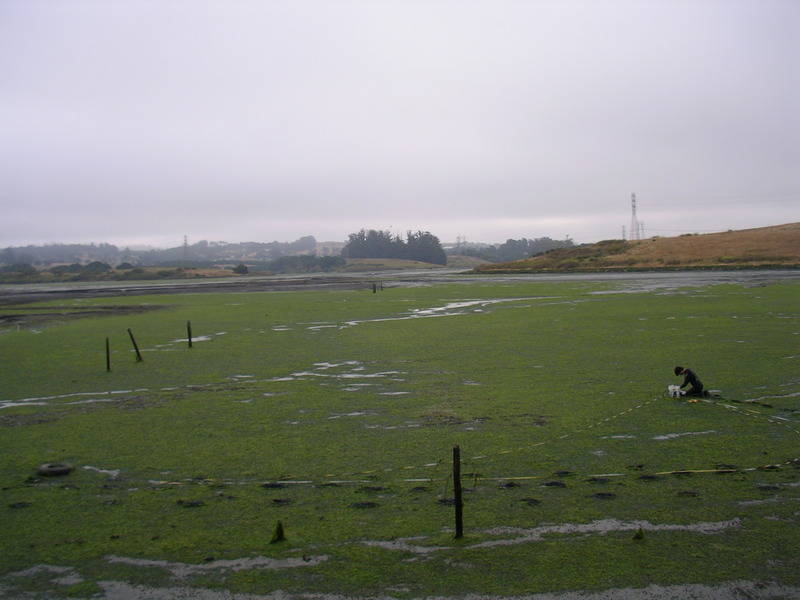 Along with Kristy Kroeker (UCSC), we are looking into the future by creating future acidification scenarios and combining it with an additional stressor of anthropogenic nutrient loading to look at species interactions and productivity of eelgrass Zostera marina. We are using mesocosm experiments that manipulate pH, nutrients, and consumers to investigate tipping points related to the interaction between shade causing algal epiphytes and eelgrass. 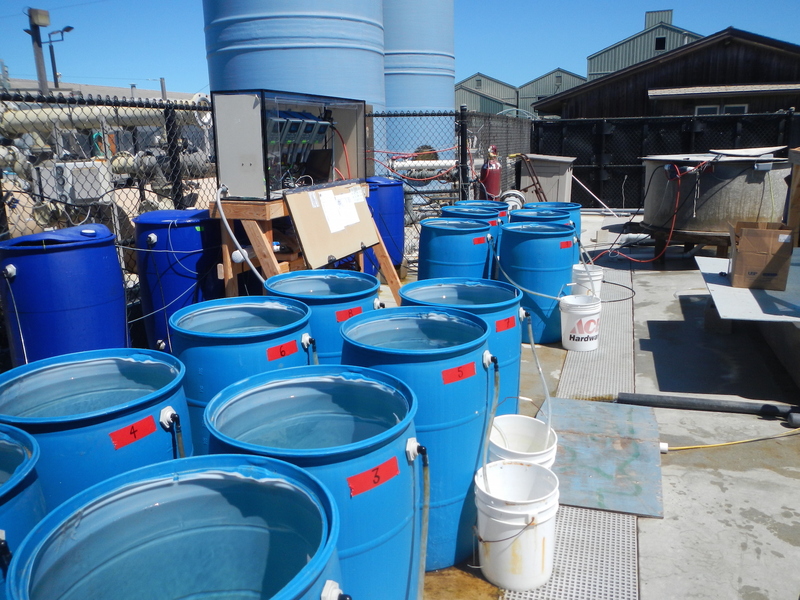 Mesocosm array at the University of California Santa Cruz’s Long Marine Lab testing for the effects of nutrient loading (eutrophication) and Ocean Acidification on seagrass communities. 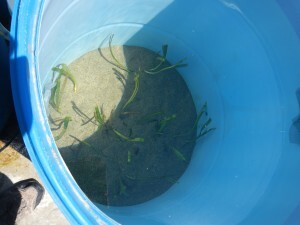 (Left) Recent seagrass transplants getting acclimated to their new acidic home. (Middle) The mesocosm (barrel) set up at the Tank Farm. (Right) The brain where all of the magic happens. Honig, S., B. Mahoney, J. Glanz, B.B. Hughes. 2017. Are seagrass beds indicators of anthropogenic nutrient stress in the rocky intertidal? Marine Pollution Bulletin 114:539-546. Hughes, B.B., S.C. Lummis, S.C. Anderson, K.J. Kroeker. 2017. 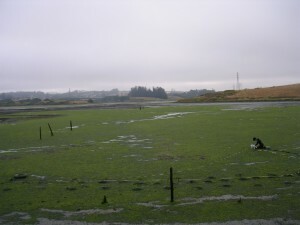 Unexpected resilience of a seagrass system exposed to global stressors. In press. Global Change Biology.